Hang on to your hats, Gleeks! Lots of interesting stuff here. Check out Quinn’s new look! Or who Santana is singing to in the courtyard! Ok, yeah, I’m getting excited. You? 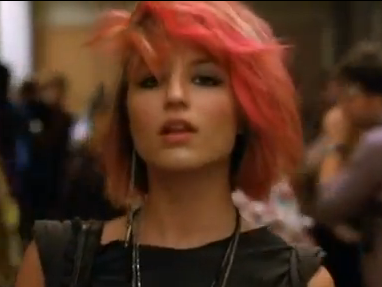 I was sad to hear that Quinn’s hair is apparently back to normal blonde after the first episode? Didn’t she tweet something along those lines? Hope Rebel!Quinn wasn’t just a dream sequence or costuming for one number!!! I’m getting very excited. It’s a delicate balance, trying to be chill and patient without losing momentum entirely! And yet I know it will not live up to my expectations at this point, as I start to watch it week to week, instead of all in one Netflix-fueled run. lol if her hair goes back that quickly, sounds like a very short story arc. Hm, if she’s smoking (which I’ve heard she is), I wonder if they’re actually going to show her quitting. It’d be very irresponsible to show her taking it up and just quitting like it’s no big deal. Oh, I took it up and stopped many times in my youth. Not a big deal if you’ve only been a poser smoker for a week or two. Oh God, from the get-go if I wanted to quit I had to go through a week of crazy. Thankfully just finished it again. Seriously, I think I was addicted from the very first drag. I am so NOT an addictive personality type. I don’t think I could develop an addition if I tried. Obsession: yes. Addiction, physical need? Nope. I’m sorry it grabs you that hard. You are a good advert for why one should never start! I want Kurt’s senior year to be magical too… I can’t believe they’re almost back! gah thanks! look at you updating me when I thought I was updating you! Oh, Kurt! He’s so darling. I will miss the drama-heavy Kurt of S2, but am looking forward to delicious eye-rolling goodness from him in S3. Sorry, I got all over-thinky. I’m REALLY looking forward to seeing Karofsky again — he said all summer he was waiting to get the call to start filming, waiting waiting, now he’s being coy (Twitter) and not saying whether he’s back or not. This change suggests to me he is back at work — which makes me very happy!